Russia’s Black Sea resort is a mecca for tourists in search of extreme summer activities on both land and sea. Your body falls faster and faster until you feel the lifesaving tension of the rubber band that yanks you out of death’s grip. 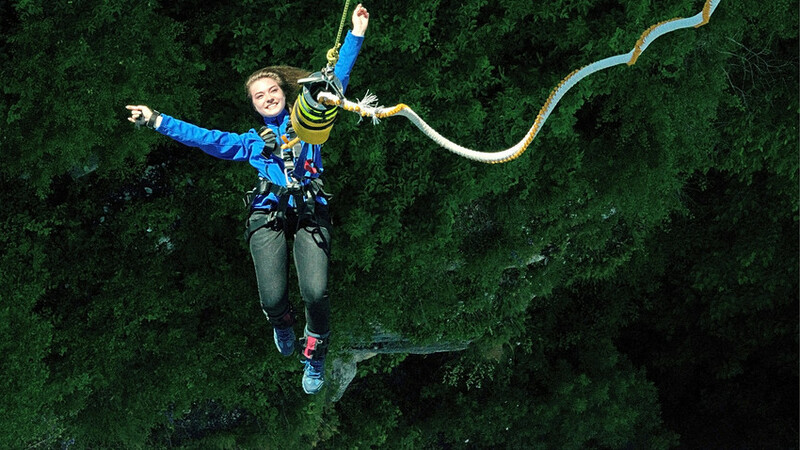 Two bungee platforms, 69- and 207-meters-long, are a major draw for adrenaline junkies at Sky Park, the famous mountainous resort. The park also has a more egalitarian attraction – a long suspension bridge that inspires awe while guaranteeing complete safety. The bridge’s hollow and transparent floor makes the first step an exercise in bravery, but even small kids manage to overcome a fear of heights. “We try our best to dispel the myth that Sky Park is designed exclusively for adrenaline junkies. We want people to know it’s a family venue where they can bring kids and not fear they’d be out of place,” said Maxim Maximov, marketing communications manager at Sky Park AJ Hackett Sochi. Indeed, the park offers numerous activities that even the unadventurous can appreciate: concerts at a small amphitheater provide a majestic view; a rope park; a climbing wall; and a restaurant with a panoramic view. There’s nothing more exciting than speeding like a bullet in a race car. Sochi Autodrom, the first and only F1 track in Russia where the Russian Grand Prix is annually held, gives tourists this unique opportunity. The Sochi track offers two packages to choose from: either you trust yourself in the hands of a professional driver who takes you on an extreme ride on the track, or you sit behind the wheel of one of the race cars that the Sochi Autodrom offers in what they call a “masterclass.” A professional driver accompanies you during the fastest ride of your life. Sochi might not strike you as the best place to catch a wave: the Black Sea is often too calm to generate great waves for surfers. Still, a small group of enthusiasts have set up a surfing camp on the Olympic Beach in Adler, Sochi. A professional, who stands on a surfboard and holds a paddle, can slide on the waves he catches far from shore. Novices can lie back and fully rely on a professional to take them out to sea on surfboards. Savvy surfers are free to rent equipment and make their own fun on the Black Sea. This amusement park takes you into the world of Russian fairytales: giant sand sculptures inspired by Russian folklore; majestic castles filled with stores and venues for the most surprising masterclasses; a beautiful pond full of melodic frogs; and other entertainment designed to amuse children and adults alike. Extreme fans won’t leave disappointed: the variety of awe-inspiring roller coaster rides ensures visitors get a rush. In Sochi, the fun goes on even when winter starts. Here’s a brief guide to skiing in Russia’s Winter Olympic capital. Russians bare it all: Why are nudists from across the country heading to Sochi?